We left off with a reprimand from the boss, Sun-gyeon, toward Osol. He thought she was to blame for the incidents at work and that she was dressed prettily to go on a date or pick up a guy. But she was actually dressed nicely for her mother’s memorial. Sun-gyeon does not know that, though, I’m sure he is going to find out today. Recap Countdown: Starts at 9am!…Check twitter for updates! Sun-gyeol yells at Osol about destroying their image beause of her own mistakes. She apologizes but he tells her that she is saying sorry again. I don’t want to see you anymore, just leave from my office and my company, GO! The music kicks in as she kind of bows and starts to leave. The secretary looks sorry about her leaving and sees that Osol is limping a little bit. Osol goes to her mothers memorial. OS – Mom, how are you? I am super pretty right? I picked the best clothes I have in the closet to see you. how do you like it? Do I look a little bit like a girl now? I don’t clean and you worried baout me because of that and because I am clumsy. But you are the same. You are pretty. I am envious of you because you are so pretty. Actually, I had a hard time today….Well, what if I didn’t quit competing athletically? The medals are nothing. I look stupid right? Why did you go back in to the building to get it back? *crying* Aih, chincha, I didn’t want to cry today. I didn’t wear my sunglasses today. I always wear them. I try not to cry. She wipes her tears and puts her flowers on the memorial. But then she sees a yogurt there. She wipes her tears and tells her mother that she will be back. She runs outside and we see that Choi has just passed by. he hides from Osol and then watches her walking around looking for soemthing. Osol walks up the painted steps, home. She sits on the steps and drinks the yogurt. Choi – Ah, this is not like the Shalin Temple, why can’t I get used to these high stairs. Choi runs into Osol and asks her if this is a special day for her? You look different. She asks him if it is a special day since he looks different as well (he is wearing a suit). They both sit on the steps. She grabs his bag and asks what that is, but she sees that it is yogurt. She looks knowingly at it. He mutters that he heard today was her mothers memorial her appa told him. They start to playfully talk about her appa telling everything and how they are in the same building and all those things. So he isnt a stranger to her. He asks her if she wants one, she says that she has one. She asks what he thinks it is? She says it is a yogurt but it isn’t just a yogurt. it is comfort. When I was young, whenever I cried, Mom took yogurt out from the refrigerator because even if I was super sad, if I had one of these then I stopped. There is someone that puts yogurt on my mothers memorial for 5 years. I don’t know who they are, but it comforts me as if my mother put it there. Today was like that, I wanted to cry, it was too sour sweet that I could not even cry. SG looks for the figurine replacement online. His secretary, Gwon, comes in and says that they found it. But then she tells SG that today is Gil Osols Mothers memorial day. She told me that she had to go sometwhere in the afternoon, I think she is visiting her mother. SG thinks back to what he said to Osol about hitting on customers with her look today. His vacuum rolls up to him, he tells the vacuum that it was not his mistake, he did not know. But then he says that he will go there, okay. Osol and SG continue walking home. Her leg hurts so he mentions it and says it looks like her tendons hurt. She tells him that he sounds like a doctor when saying that. he kneels to give her a piggy back ride, they are neighbors. But she calls him a pervert and tells him that she does not need it. She keeps walking and says that some days you don’t drink but become sentimental. You write somthing on SNS int he morning but become embarrassed about it at night. You know. After I told you that story, I became super embarrassed now, so just filter that away. Choi smiles and says, our first floor girl, you get cuter and cuter. She asks him why she is “our” to him. He just mutters that it is because they are the onely ones there. But then SG shows up. Choi introduces himself and says that he saw him when Osol was drunk. They have an awkward meeting as SG thinks that this is that pervert? CHoi wonders why everyone calls him a pervert and says that he is not a pervert, he lives upstairs and eats at her place and all that. But Osol tells him to just walk on ahead. Osol asks SG why he is there. They go to sit on a bench somewhere. He has his scarf out. She buys himsomething from a vending machine but he says that he is okay. You can drink them both. Then he clears his throat a few times and stands up. Osol wonders why he came allthe way to her place this late? He tries to find some words and says well…um….the figure, how are you going to pay for it? She asks how much it is. She is all like, what? He tells her to come to work. I am sorry, I went to far this afternoon. i am sorry. Then he asks her how her leg is. She looks at her leg and says that she is fine. He yells that she should tell him that the client pushed her and she tripped on that robot and she is the victim! i can’t stand anyone touching my employee!….well, anyway, just come to work on time. You can repay me with your hard work. OkayGoodbye. He leaves. Osol smiles, she got her job back. A little cat meows up to her so Osol smiles and gives her a snack. SG comes back and watches Osol feed the cat. She asks the cat how eunnie looks, she is pretty right? You should tell me that at least. SG smiles. The next day, Gwon gives the collector the figurine. But then SG mentions that he saw the CCTV. It is better to check if our employee really broke it. Don’t you agree? Do we have the doctors opinion on Gil Osol’s ankle, it looks very bad. Gwon says yes, it is more than 4 weeks injury and we are going to sue you for the injury. The person says that he was just upset that day and found out later that it just fell. SG looks at him sternly. So the man falls to his knees and tells him that he is sorry, please give me a break. SG tells him that he should not apologize to him, he should apologize to his employee. Cut to the man apologizing to Osol. She says that it is okay but he is adamant to apologize and says that it is his fault and he really wants to apologize. He gets on his knees and begs for her to forgive him. She tells him it is okay, you can get up, get up. Meanwhile, the other guys clean and talk about how SG told her to quit but then apologized to her right away. Maybe he has a multiple personality disorder. Osol is cleaning the clock and has to climb a ladder to do it. Young-sik was holding the ladder, but he has to walk off to get soemthing. He tells OSol that he has to get something so she says that is fine, just go. YS leaves and runs into SG and Gwon who are walking up. Osol says hi to them, but then ets unbalanced and falls. SG runs up and catches her. VO – you will be normal again in axial stress syndrome. The only acception is, in Korean medicine, it is love sickness. You remember, it is also a part of PTSD where the other person comes into your mind continuously and unnexpectedly. The doctor that SG is talking to is Choi. VO – It is uncommon, but if your sickness is love sickness, this could be a good treatment plan for your phobia. Back at the clock, Gwon asks if the CEO is okay, he says he is okay. But he looks at Osol whom he is still holding. VO – Why am I okay holding this dirty and sweaty woman? he puts her on the ground and asks if she is okay. She says she is fine, but then we see the firty towel fall off the clock and onto his face. He picks it up and asks what it is, then passes out. Later on that night, jae-min tells Osol all about Sun-gyeol being germaphobic like a character in Marvel comics. He is not just germophobic, he is very very serious about it. Did you hear about what happened in high school with the post it? Flashback to SG in high school getting an award. VO – He was smart and got a lot of awards but each time…. SG asks for the award to be sent as a delivery to his place and to pay for shipping. he adds a postit. Osol thinks that is nonsense. JM starts to tell her about what SG said when he was a baby that was born. Instead of crying he asks the doctor if he sanitized his scissors. Young-sik comes up and sits on the table so JM and YS start to playfully argue a little bit but then JM talks about SG again and says that he heard he went to america to be treated. He is the perfect guy, but he is germaphobic. It looks like the entire team is there eating. YS wonders why a germaphobe caught noona. Osol thinks that is instinct. But JM thinks that maybe maybe mabye he….you….Gil osol…..*sniff* …..but he Gil Osol, did you wash your hair today? Osol asks if it smells? Ididn’t wash it. She puts her head to YS to smell it. he hops away. Sun-gyeol wakes up at home. Gwon and his mother are there. His mtoher wonders about the bird poop last time and now what happened? SG sits up. Gwon says that she aws suprisded, she did not think he would catch Osol. Are you okay with the germaphobia? SG says he is okay. He gets up and awlks to the kitchen. His umma says that she brought fruit and asked an ajumma to cook for him. But he says that he told her not to bring anything, he jut throws it away and it messes up the house. So don’t do it. Umma looks at Gwon as if to get her help and then leaves. Osol looks at his hand. Outside, Umma asks Gwon what it means, Osol or whatever? Sun-gyeol hugged? Osol talks to her friend Joo-yeon about SG being super germophobic, maybe she should not have kissed him that time. JY starts to talk about how he is like Ghandi and should get a Nobel prize or something. Osol tells her to be quiet, I am trying to talk to you seriously. but then a car pulls up to Osol and the driver hops out. He says that she is Osol-i, right? Cut to Osol meeting SG’s Mother at a cafe. Osol asks who she is, Mae-hwa tells her secretary to tell her that she does not have to know. The mother speaks through the secretary all this time. She basically whispers in the secretaries ears. 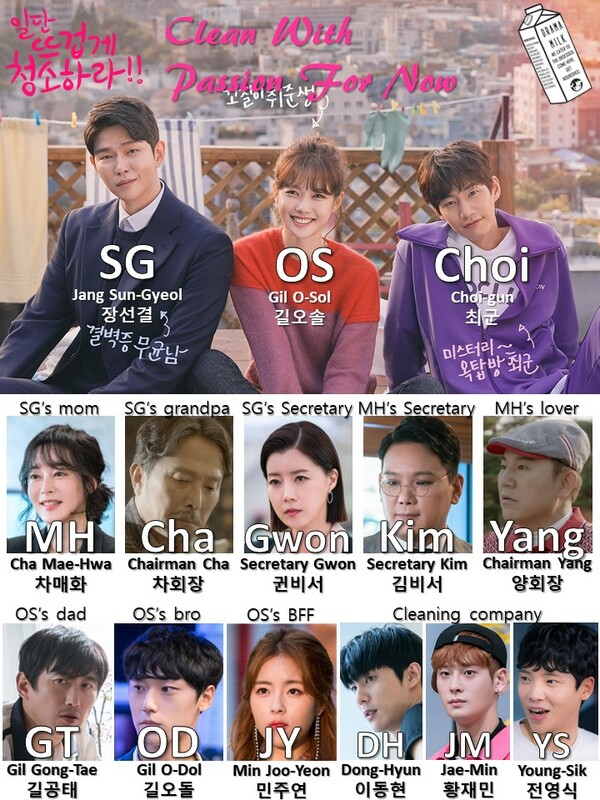 So Osol knows that the mother is SG’s mother because she saw her in the office once. You are a very pretty person. The secretary says that she is lying (on his own, lol) but then umma tells Osol not to be next to the CEO. She asks why she is talking through her secretary. The sec says that they just want to show that they are on two different levels, but it sounds weird when said out loud. Elsewhere, SG walks to work, his hand is fully bandages as if sprained. he continues walking and sees Secretary Kim outside. he walks up to him and asks why he is there so early. Cut to the inside of the cafe, the mother and Osol are talking by themselves now. The mother is actually pretty nice and says that she is not worried after meeting her, sometimes she thinks too far ahead. you know, how parents thing Osol tells her nooo, no no, definitely not. Umma smiles and says that she thought of something unneccessary. I know that nothing will happen with you, that comforts me. Osol asks why she thinks it won’t happen? Ha ha, it could happen, ha ha. Umma sits back and thinks, hmm, what is with this young girl? She tells Osol to work for her son harder. Then she gets up to leave. But Osol wants to know why this might not work? SG steps into their conversation and asks his mtoher what business she has with his employee. He also won’t let his mother touch his injured arm. Umma is pretty said that this nothing woman can touch him but not his own mother. But it sounded a bit mean. She tries to back track it a little bit. SG tells her to as well. So umma apologizes. Osol accepts it happily. SG heads out and tells them to go to work. Umma tries to talk to her son but he is already gone. So she tells Osol to not meet a guy like her son, meet a nice guy. Osol goes outside. The secretary tells Mae-hwa that they came here to kick out a racoon but you are the one that is kicked out (to the mother). Osol is all like, what? Who? But the secretary says that it is nothing and drives away. (they call Osol, raccoon sometimes). SG meets Osol outside and tells her that she should not be late, that will be 3 strikes. Osol tries to say that he met his mother, that is why she might be late today. SG tells her that he did not tell her to meet his mother. But OSol says that he can’t just stop meeting the bosses mother. I would have to meet the bosses dog as well. he is all like, huh? She thinks for a moment and then thanks him for yesterday. He would have had a lot of trouble if it wasn’t for him. Thank you. if you need help, just tell me. i will do anything to help you. I am sorry for you. He thinks for a moment and then says that he needs to check something. Can I have your hand? But the bus shows up at that moment so she yells that she has to run off and catch it! She runs off. Gwon jokes with Sun-gyeol that he finally had to have the cast. Despite your inconvenience, you saved someone. it is your first time rescuing someone. SG clears his throat and tells Gwon that he always told her he is a great CEO. he goes into his office. But actually, he has a hard time washing his hands and thinks about what Gwon just told him. Outside, Osol and Dong-hyun clean while Osol talks about the boss. Dong-hyun does not talk about the boss though. So Osol asks why he does not. He is al like, there is nothing to talk bad about. But then Osol sees her father in the parking lot and has to run off and hide. Dong-hyun wonders what she is doing. Then he sees Gong-tae. GT tells him that he is a call service for cleaning cars. He gives him his business card and leaves. Osol comes back out and says that was her father. he doesn’t know that she is working at a cleaning facility. She looks at the business card that her father gave Dong-hyun. Elsewhere, Choi talks on the phone to SG about holding that sweaty woman. Choi – you held her? that sweaty woman? And youa re still okay? You did not have any fainting symptoms? SG – Stop talking about all that falling in love nonsense, just tell me in a way I can understand. Can my germophobia be beter all of a sudden without reason? Choi – No, as far as I know it does not happen because phobia’s start mentally. If the symptoms went well then there is a good reason for it. SG – What is the reason? CHoi – I don’t know, you should know better than me. Lets do this, is she the only one you can touch or can you do that to someone else? SG – Test? Lets do it. SG gets up and looks around the break room for something to test out. he goes up to the kitchen area. VO – Touch someone elses things, not hers, if it is possible then we should celebrate that you are cured. SG tries to touch one of the other guys mugs, but he can’t. The mugs all have their own names on them. He tries several times. He holds the cup but then the team walks back in so he hides with the cup in his hands. The team comes in talking about all the gross things they cleaned and how condoms where everywhere(?). Osol tries to get something to drink with her cup, but she can’t see it. The other team members tell her not to waste her time looking for it and to just use a disposable one today. SG keeps hiding. But YS accidentally spots him after dropping something and screams. SG screams as well, lol. Everyone stands up and wonders why he is hiding, are you hiding? SG says that he is not hiding! I came in here to look at stuff! Be sure to clean well! Do your jobs! Okay! he slowly backs out. The team wonders, does he check our room when we aren’t here? SG walks out holding the cup and looking at it. Gwon asks him to sign the documents so SG smiles and says he will do it now! Gwon thinks he is acting a bit suspicious. Elsewhere, Choi accidentally runs into one of his old clients. They end up going somewhere to drink. Maybe her place? The woman says that her life is counterfeit. He tells her that life does not have counterfeit. But she just says that she makes her living lying to others. She thinks that her shaman abilities will not come back with the treatment and she is sorry that Choi is giving his services for free to her. he says it is not free, he is getting this coffee from her and he can at least help her to feel better, so trust me one last time. She tells him to just come out from that accident, 6 years past already and it wasn’t your fault. That time, the building collapses, I thought my life had collapsed. I could not eat or sleep. You listened to me and gave me strength to keep living. You tried hard and became a good doctor and still remembers us and visits us. Choi – I am a good doctor, but you shuld not say I am a great doctor. Woman – did you see that student that you said changed your life? She should be a pretty young lady now. Choi – yes, she lives her life a lot stronger than I imagined. Cut to OS hopping off the bus. he brother texts her to bring chicken. OS sighs and thinks that her brother asks her to do so much and doens’t do anything. She sees a chicken place that is offering bones. We see that she gave her brother a huge femur or something when she gets home. It is huge, like a dinosaur bone. Her father is there as well and happily talks to her about chicken and things. Osol tells appa that she saw this busniess card and worred about him. But appa says that he is still strong now, it is difficult to establish a business but I don’t need any money or a free schedule or anything. if you need anything then call me. Also, I made kimchi pancakes. He points her in the direction of the table where the kimchi pancakes are stacked. They sit to eat. Appa tells Osol to take some to Choi as well because he helped appa with the business cards and didn’t complain about it at all. So Osol takes Choi some of the pancakes. But he is not there so she thinks he might be at the comic book library. however, he gets home right then and wonders what Osol is doing looking inside a bachelors house this late. I’ve been watching you. Osol is annoyed and asks if he is really a pervert then casually hands the pancakes over as if she would rather drop it all on the ground. Choi happily takes it and says that he has mackoli, want to have some? Osol happily says yes (call). they both sit and eat the pancakes and drink the mackgoli. She asks him if he has family and thanks him for helping her appa. He asks why she is curious about him. Then he happily says that they are like family, they eat together and sleep together. She grumbles that she can’t tell him anything. He gets serious and tells her not to do everything by herself, just rely on others like me. She tells him that they should tell each other a secret. He agrees so she goes first. Osol – Honestly, I work at a cleaning company. Choi – Is that your secret? that isn’t really a secret, a clean-. OS – Stop! Dont’ you know what a secret is? Don’t spread it everywhere! Then Osol starts to tell him about how her father does not want her or her brother to do cleaning work because that is what he did his whole life. It is not easy. But the hardest thing is living like someone else. It is easy for me. I enjoy it. I thought I would do it and quit but I like it. I just work hard and sweat. It almost feels like when I competed athletically. Tell me your secret. Choi – My secret is that I have someone I liked for a long long time. OS – Like a one sided love? Did you confess to her? OS – Yes, timing is the most difficult thing. One sided love is difficult. Who is the person you like? Was that not a good question? Choi – Someone who is very bright and pretty. I want to protect her so she can smile all the time. Later on, Choi goes inside and looks at the yogurt in the fridge. Flashback to a protest. SOme people do not want to remodel the city. They are protesting it. Right now they are eating outside. It looks like Choi is one of the workers who is a “problem solver” who puses the people living there away? They wear blue vests. osol gives him a yogurt and asks if he is a student? Is this a part time job? I saw you reading a book. My mother said that the people destroying the building don’t actually want to do it. It looks like they are having a hard time so don’t just ignore them. She smiles at him and he smiles at her as well. But then her umma calls her name so Osol tells Choi to drink the yogurt while it is cold. Osol runs off to where her parents are in the red vests protesting. In the present, Choi drinks the yogurt and says it is so bitter-sweet. Meanwhile, Sun-gyeol looks at the cup while at home and wonders why he took it with him. He touches it and smiles. He is fine. On the TV there is a documentary on love and how Socrates said that love is a feeling that stops rational judgement. God gave the lack of judgement due to love which is not something that ratinal can decide. Neitchie also said love involves losing mental abilities and how it starts with someone. it is not for everyone else, only for that one person. SG wonders if that is true, no that is nonsense. But the TV says it is true. it is almost as if it is talking to him and tells him that he lost his decision making ability because of love to someone. he starts to see Osol and then sees “love” everywhere. Osol washes her hair which makes her brother think that today is special. But she tells him that she washes her hair everyday! but there some other smell in the air, her bone broth! She runs off. it is 6am and Sun-gyeol wakes up. His vacuum is cleaning again. He looks like he has a cold. he tells himself to wake up, wake up, this is nothing. The thing on TV is ntohing, just wake up. He hits himself on the face a few times and tries to center himself. he goes to work, but it looks like he has lead in his shoes. he talks about broadcasting people and asked how they ocoul dmake that program so bad. But actually, all the people in the ofice think that the love documentary was the best! They ask SG if he watched it. He asys that he did not! Why shuold I watch that! Then he looks at the room and thinks that there are so many germs. He starts to pray his disenfectant all around and talks about how they will super clean everything tomorrow! he keeps muttering about htat as he sprays his spray. But then Osol comes in and calls his name. He remembers her image on the TV and then starts praying her with the spray. he is going buck wild. SG – I AM NOT IN LOVE, I AM NOT IN LOVE I AM NOT FALLING IN LOVE! Everyone is all like, huh? Nothing much to say, it was a cute and bubbly episode. From the preview I have to say – this show is going to have to stop it with the sudden kisses. I will let it slide since she kissed him suddenly and now he is kissing her suddenly, but come on. Can we have mutual respect for one another in the proximity department? That is my gripe. VO – I knew that he had a crazy side, but now I can’t even guess what will happen. VO – Who are you? OS – I am here to clean. Choi – The one that said he can only touch is – Gil Osol? OS – CEO, do you know that you are strange recently? SG – Can you leave your hand here a little bit, I need to double check something. Türkiye’den sevgiler. Ceviriyi heyecan ile bekliyorum. Simdiden ellerinize saglik. Merhaba! ingilizce tercüme edebilir misin? Google çevirisinin doğru yapıp yapmadığından emin değilim. the storyline is a lil’ predictable but the lead actors are doing such a great job! Yep, all the actors are great. The preview…i wonder if that kiss is just some sort of an imagination or something? Hmm, actually it could be an imagination. It was super cute at the beginning but I think SG is little OVER the top! Too much of everything gets boring. I do want to see both leads realizing how much they like each other. That will make this show little more exciting? I can already see SG mom is going to be crazy with OS… Chabal guy and poor girl!!! Thanks V for the recap!